This summer, conferences will take place in seven locations across the US, Europe and Asia. Members of our global community of developers will meet to share best practices and learn about how eBay is leveraging its technology to make it easier for our developer ecosystem to create innovative new eBay experiences. Display a list of the best selling products in a category, sorted by product demand. The latest version of the Browse API is now available. 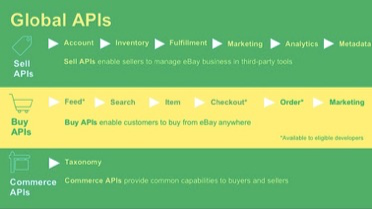 The latest release of the Buy API is now live on Production. Browse API v1 beta 5.0 Now Available in Sandbox! The latest version of the Browse API is now available in the Sandbox environment. See the Preview of Browse API v1_beta.5.0 Changes release notes for details.